NEW DELHI: Despite all the efforts put in place by social media companies to show who is paying for the political advertisements on their platforms, the users may not know the actual amount spent to run political campaigns on these websites. Facebook has a searchable database for political ads which anyone can access. This Ad Library report from the social media giant shows that Indians have spent over Rs 6.5 crore in over 30,000 ads related to politics since February 2019 — in the run up to the general elections. Similarly, Twitter also has an Ad Transparency Centre which allows one to search which account has spent how much in the past seven days. 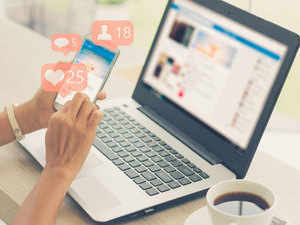 While these efforts are being regarded as important steps towards bringing transparency in the political process, they may not reflect the complete picture of how the social media space operates, according to experts. “Influencers play a very important role in political campaigns and 90 per cent of the transactions related to these campaigns are done through cash,” social media expert Anoop Mishra told IANS. Knowing which party is spending how much on social media is important because much of what trends on Twitter or what becomes popular on Facebook – with potential to impact voter behaviour – may actually be due to the money and manpower of political parties while creating an illusion of organic support from hundreds and thousands of users in these platforms. “Every political party including the BJP (Bharatiya Janata Party), Congress, Samajwadi Party and BSP (Bahujan Samaj Party) are trying to push their agenda on social media. But those parties with greater money, manpower and tech expertise are likely to win the social media war,” Mishra said. He added that political parties were employing a large number of people to make their propaganda material viral on social media. “In terms of political ads, social media companies should allow only certified agencies to post ads. This would make the monitoring process much easier for everyone. Allowing any individual to post political ads complicates the monitoring process. This is a big loophole,” he said. “Encrypted platforms like WhatsApp could be used extensively to spread advertisements and propaganda, which could be difficult to be tracked,” added Prasanth Sugathan, Legal Director, Software Freedom Law Centre (SFLC.in), a Delhi-based not-for-profit legal services body. The Election Commission is in talks with the representatives of Internet companies, including social media platforms, on the use of social media for campaigning in the Lok Sabha polls while the Model Code of Conduct is in force. But even as the Election Commission has made social media companies follow certain norms, such as pre-certification of political ads to prevent misuse of the platforms, such measures are unlikely to bring adequate transparency to the whole process.